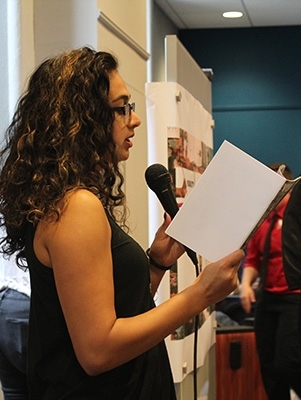 Congratulations to Peace and Conflict Studies student Jasmine Rashid ’18 on the successful printing of the third edition of VISIBILITY Magazine. “I couldn’t be happier and I can’t wait to see the direction that VISIBILITY goes in the future,” says Rashid, who will graduate this spring. The Peace and Conflict Studies Program at Swarthmore College is elated to announce the naming of Ruby Bantariza ’20 and Ariba Naqvi ‘20 to the new class of Mellon Mays Fellows. The Mellon Mays Undergraduate Fellowship (MMUF) program aims to increase the number of minority students and others with a demonstrated commitment to eradicating racial disparities pursuing Ph.D. programs in core fields in the arts and sciences. The program provides fellows with a faculty mentor, term and summer stipends, access to MMUF programming, including an annual regional conference, and additional benefits if they enter a Ph.D. program within 39 months of graduation. The fellowship was established in 1988 by the Andrew W. Mellon Foundation and initially involved eight charter members, including Swarthmore. 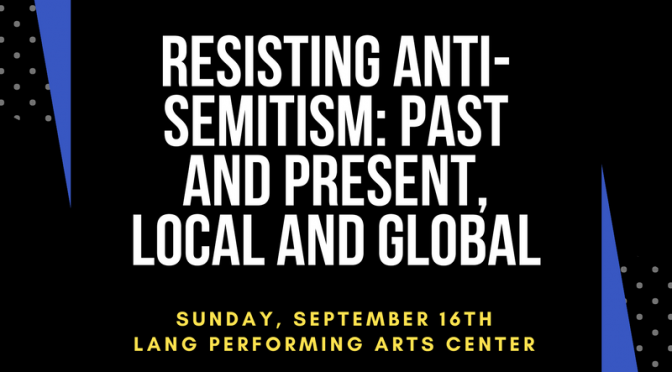 “Resisting Anti-Semitism: Past and Present, Local and Global” is a symposium to be held at Swarthmore College’s LPAC Cinema on September 16th, 2018, co-hosted by Dr. Sa’ed Atshan of Peace and Conflict Studies and Rabbi Michael Ramberg of the Interfaith Center and the Office of Religious and Spiritual Life. The subject of anti-Semitism has sparked heated debate in colleges and universities and we hope to model productive dialogue and engagement on this important issue. Modern anti-Semitism, invented in 19th century Europe drawing on millenia of anti-Judaism, has caused incalculable harm to Jews. The harm it has caused is not limited to Jews, though. Modern anti-Semitism has also indirectly harmed other vulnerable groups, by misdirecting these groups’ anger towards Jews when in fact others bear responsibility for these groups’ oppression. After the Holocaust many people and institutions committed to oppose anti-Semitism and the cynical misuse of it, but in recent years anti-Semitism has experienced a public revival and committed anti-Semites and opportunists willing to exploit anti-Semitism have come to hold positions of power around the world. While it has proven frustratingly resilient, wherever it has arisen, anti-Semitism has encountered resistance and its opponents have found effective means of opposing it. “Resisting Anti-Semitism: Past and Present, Local and Global” aims to seriously engage with the topic of anti-Semitism – the forms it has taken in the past and the forms it takes now, the ways it has been successfully opposed in the past and the ways it is being successfully opposed now. We will bring together academics, rabbis, activists, and artists, among others, with expertise in three regions – North America, Europe, and the Middle East and North Africa – and engage them in conversation with each other and the Swarthmore community. Enriched by diverse perspectives of our distinguished panelists, symposium participants will gain a deeper understanding of the form of prejudice and violence, an enhanced commitment to opposing it, and a strengthened ability to do so. Sponsored by Swarthmore College Peace and Conflict Studies Program; Andrew Mellon Foundation; Swarthmore College Lang Center for Civic and Social Responsibility; and Swarthmore College Office for Diversity, Inclusion, and Community Development. A summary of the schedule is posted first, followed by a more detailed schedule. The symposium will be held at Swarthmore College’s Lang Performing Arts Center Cinema on September 16th, 2018 and will be open to the public. Swarthmore College is located at 500 College Avenue, Swarthmore, PA, 19081. Free visitor parking is available in the Benjamin West Parking Lot on Chester Road (#5 on the Swarthmore Campus Map). The symposium will be held in Lang Performing Arts Center Cinema (#34 on the campus map). From the Benjamin West Parking Lot, walk towards campus until you reach the large, tree-lined path (Magill Walk). Continue up the path until you reach the end of the path, then turn left and turn right at the end of the large building. The symposium location will be straight ahead. 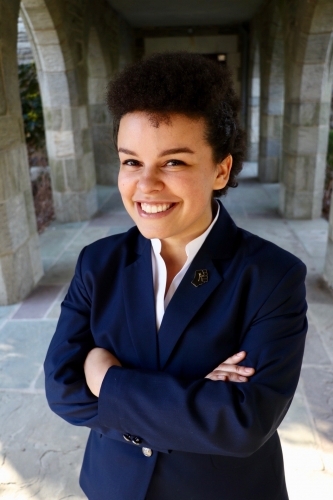 Taylor found out this week that she is a recipient of the prestigious Truman Scholarship. Thank you to the Swarthmore College Office of Communications for covering Taylor’s story and major accomplishment!